I’ve got roasted garlic and tomatoes, and I’ve got feta cheese, and I’ve got arugula, and I’ve got artichokes, and I’ve got a deliciously lemony dressing. And, you may partake with me on one condition; that you listen to (read) my short rant about Spring weather in Chicago. Those of you not dealing with these same weather conditions, just bare with me! Mother Nature is currently unleashing her full schizophrenic arsenal on us. One day the temperature “soars” to 60F. The next day brings partial snow flurries and blustery winds followed by multiple days of perma-gray skies. This time of year has me craving bright Spring flavors while simultaneously hankering for Winter comfort foods. This dish is a lovely and beautiful combination of the two. The produce isn’t exactly “there” yet. My easy fix … roasting my veggies. 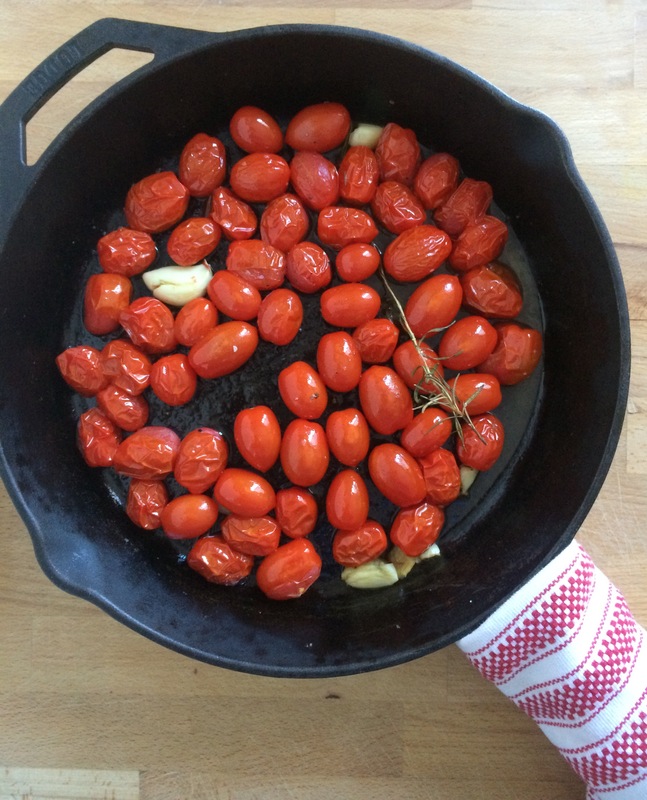 Roasting tomatoes brings out their natural sweetness and concentrates the flavor. The juice from the tomatoes combines with the vinaigrette. This coats the pasta, adding a fat free component to the sauce. The same goes for the roasted garlic. If you live in a warm weather climate, just chalk my above rant up to ‘another Midwesterner complaining about the weather.’ If you’re here with me … Just chalk my above rant up to ‘another Midwesterner complaining about the weather.’ Either way, this dish is not weather discriminant. Great when served cold or at room temperature. Light and bright, yet hearty and comforting. The answer to this cold/warm/cold/warm weather. Cook pasta according to package directions in a large pot of boiling salted water. For al dente, my whole wheat penne took 15 minutes. Drain and run under water to cool and stop the cooking. Pre-heat oven to 400 degrees F. Combine cherry tomatoes with 2 tsp olive oil, garlic cloves, fresh rosemary, salt and freshly cracked black pepper. 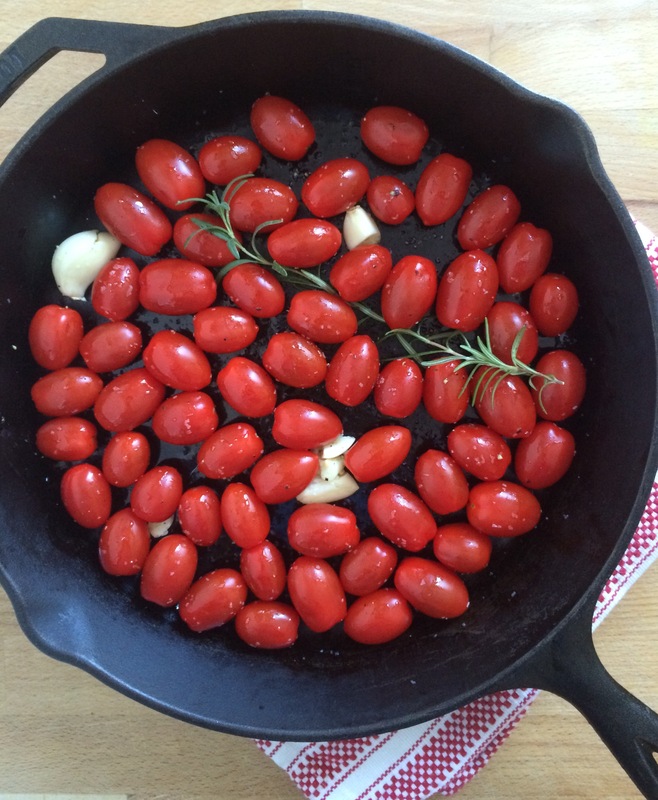 Cook for 20-25 minutes until tomatoes are soft, slightly charred, and some are just bursting. Discard rosemary and mince the freshly roasted garlic. Set aside to be added to the salad dressing. To make the vinaigrette, combine 1/3 cup olive oil, lemon zest, lemon juice, minced roasted garlic, fresh basil, salt and freshly cracked black pepper. Give the dressing a good whisk. If using a mason jar, give a few shakes. 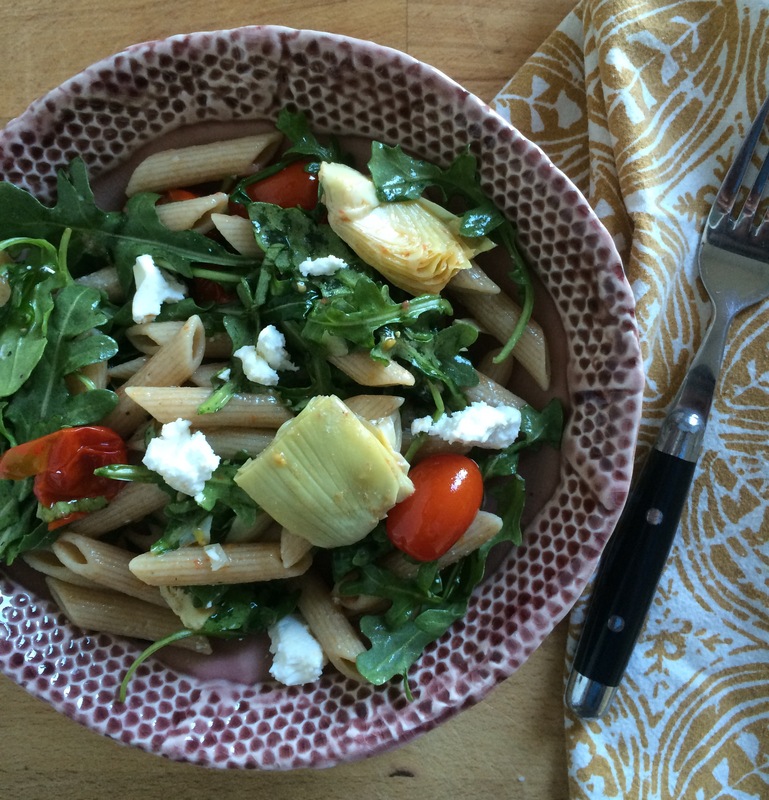 Combine cooked pasta, artichokes, and scallions with 1/2 of the dressing, and toss to coat. 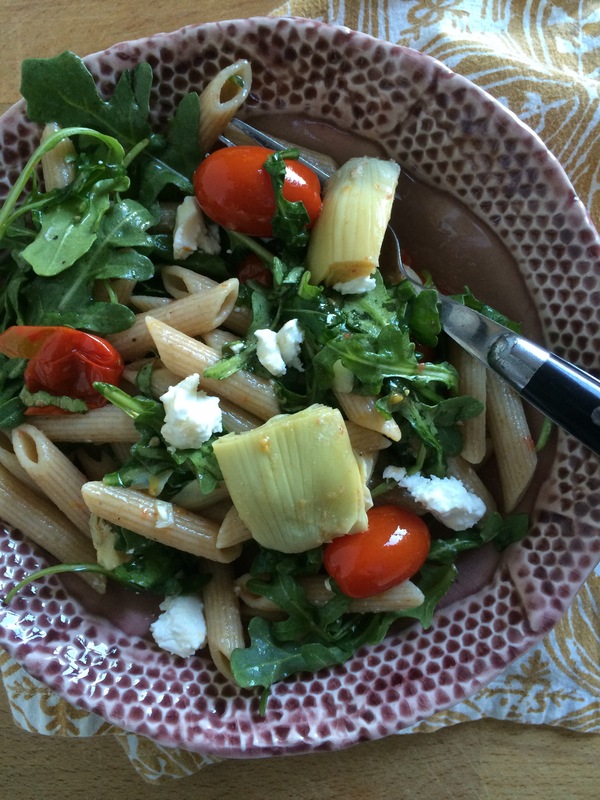 Add the fresh arugula and roasted tomatoes. Toss again *being careful not to crush the tomatoes. * Add additional vinaigrette to your taste. Note: The tomatoes are delicate and contain a lot of juice, so be careful when tossing. Also, if the tomatoes burst, the tomato juice will add liquid and become part of the vinaigrette, so be careful not to over dress. Top with feta or mozzarella cheese. Hi Steph! 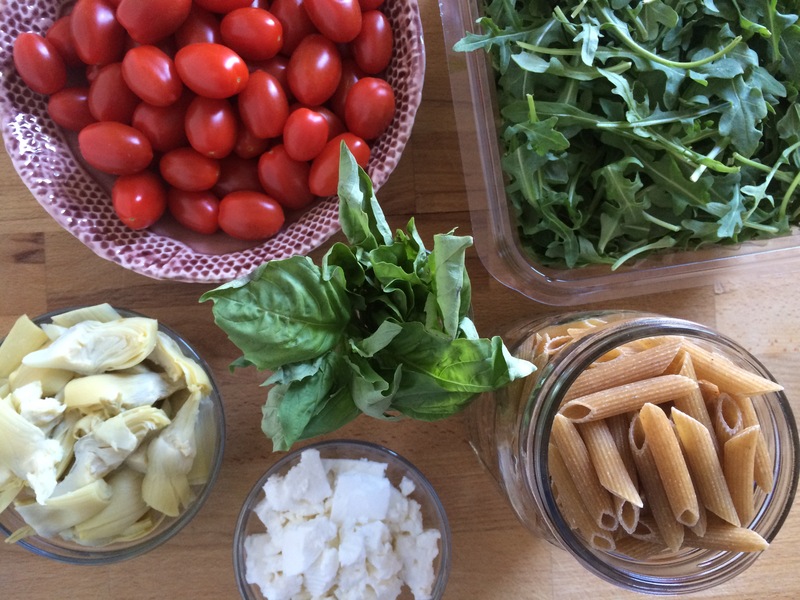 My mom does make the best pasta salad … her famous recipe will have to make the blog soon. What a sweet memory. 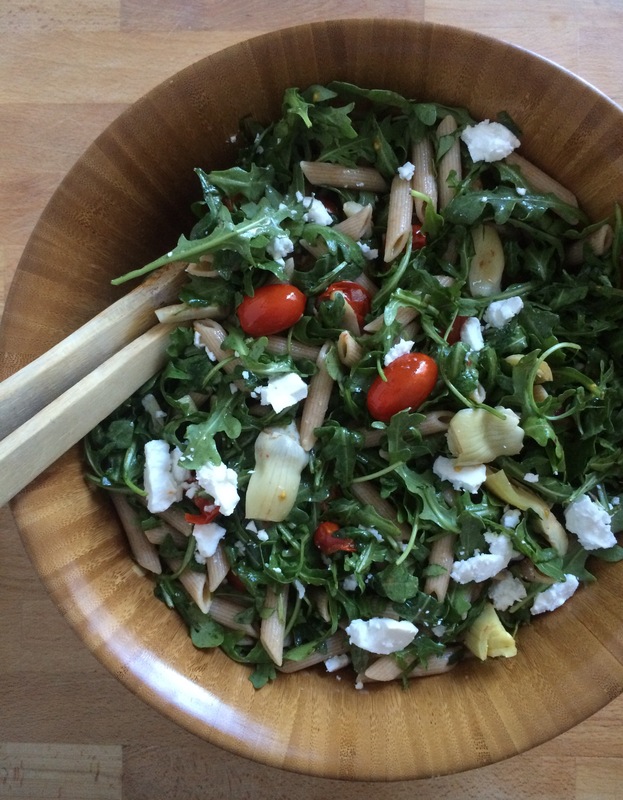 In this recipe, I would replace arugula with fresh spinach or organic mixed greens. If you use mixed greens add them at the end so they don’t get too wilted 🙂 Enjoy and Xo! Taking this to the Spring Potluck at work! Sounds so yummy! Hi Hillary! This is a great potluck recipe! I hope everyone at work enjoys it.